2013 BMW X1 Pros and Cons: Why (Not) This Car? I must admit a bias: I prefer small cars. Why? They tend to be more fun (as well as more fuel efficient and less expensive). Though far, far from the leading edge at this point, my 2003 Mazda Protege5 continues to induce more grins than nearly all of the cars I test. My ideal car would take a Protege5, add more power, and channel it through the rear wheels instead of the fronts. BMW offers such a car...in Europe. On this side of the Atlantic we don't get the 1-Series hatchback. But for 2013 we do finally get the BMW X1, a crossover (of sorts, we'll get to that). Close enough? I drove one for a week to find out. Until the Audi Q3 and Mercedes-Benz MLK arrive (they're coming), the BMW X1 has no direct competitors. So what should I compare it to? Inspiration struck as I passed a Land Rover dealer. I'll have a full review of the Range Rover Evoque after I drive one for a week in June. For the comparisons here a brief test drive must suffice. Compact and functional. Red highlights with Sport Line. Passenger cupholder an afterthought. Why the 2013 BMW X1? In my ranking of the reasons to buy a BMW X1, handling isn't getting the top slot. Why not? We'll get to that. Still, the top slot is going to a related attribute: driving position and visibility. When driving an unfamiliar, challenging road (or in traffic), an expansive windshield that isn't in the next time zone provides an essential, confidence-inspiring connection with both the car and the outside world. My Protege5 has such a windshield. Many current cars do not. Instead, their instrument panel is too tall, too deep, or both (the first in the case of BMW's latest cars). To get the open view forward cars used to offer, you now often have to get a crossover. Driving enthusiasts (myself included) often favor wagons over crossovers for their lower center of gravity, and consequent superior handling. So the BMW X1 isn't ideal. But it's not as far off as its crossover classification implies. An odd little beastie, the X1's 60.8-inch height evenly splits the 10-inch difference between a 3-Series wagon and an X3 compact crossover. This risks making no one happy. Enthusiasts seeking the sportiest driving experience will prefer the 3-Series wagon, while crossover buyers seeking visibility in traffic will prefer the X3. Yet for a combination of sportiness and visibility the BMW X1 might strike a happy medium. In the 3-Series you sit fairly low behind a tall instrument panel. In the X3 you sit so high above both the ground and the instrument panel that you can't for a moment forget you're piloting a crossover. In the X1 you sit high enough for an open view forward, but not so high that you feel like you're driving a truck. In fact, the tallest cars (i.e. the Ford Taurus) are as tall as the X1. As might be expected in a vehicle wearing the Range Rover brand, the Evoque is nearly four inches taller than the X1. Nevertheless, outward visibility is far worse. The Evoque's windshield is more distant and its windows, especially the ones in the rear, are stylishly scrunched. Second slot, still not handling. The benefits of the BMW X1's barely crossover height extend beyond visibility to fuel economy. With far less frontal area than the typical crossover, the X1's EPA ratings match those of the 3-Serie: 22 mpg city, 33 highway. These figures are quite good for a vehicle that can get from zero to sixty mph in the low sixes. Contributing: the same 240-horsepower, turbocharged 2.0-liter four-cylinder engine and eight-speed automatic transmission offered in nearly every other current BMW model. This powertrain replaced a 230-horsepower 3.0-liter inline six and six-speed automatic that was good for only 17/26 in the 2011 328i xDrive wagon. The four might not be as smooth as the old six, and it doesn't sound nearly as good. (In fact, when idling and under low loads it sounds much like a diesel.) But its fuel economy payoff is undeniable. As elsewhere, this powertrain includes an automatic start/stop function that automatically cuts the engine off at traffic lights, then autoamatically restarts it when you lift off the brake pedal. While still not seamless, this feature did operate more smoothly in the X1 than in the 328i I tested last year. The whole car no longer shudders when the engine cuts in and out. When I drove a 3-series and a 5-Series with this powertrain last year, their trip computers reported surprisingly good numbers. On a few suburban trips in Eco Pro mode I observed 38 in the 328i. Whether because the crossovers are taller or because BMW revised the programming of its trip computers, I haven't had the same experience with this year's X3 and X1. Moving with traffic in suburban driving the X1's trip computer reported 21 mpg, close to the EPA rating. Engage Eco Pro and drive the X1 like a Prius (with a similar effect on following drivers), and the number jumped to 28. Good, but nowhere near 38. All-wheel-drive explains some, but not nearly all, of the difference. A highway run to the airport averaged only 26. Perhaps the X1 can achieve its 33 mpg highway rating at 55 mph, but once over 70 mph it doesn't come close. Taller and with two fewer transmission ratios, the Evoque checks in considerably lower, at 20/28. Raked rear window looks sporty, but cuts into cargo volume. Fancy tail lights. All business. Joystick shifter less than intuitive. Okay, now we get to handling. Drive the BMW X1 like you stole it, and it's a blast. Aside from a touch of rear-end bobble-and-sway during especially aggressive transitions, the behavior of the chassis approaches perfection, with the balance, composure, control, and utter predictability traditionally offered by BMWs (if somewhat missing from their latest cars; the X1 is based on the previous-generation 3-Series, not the current one). Point with the wheel, prod with the pedal, and the X1 goes where you want it to, quickly and precisely. Dipping into the throttle while turning induces the rear end to step out. With all-wheel-drive, there's just enough such oversteer to help the vehicle rotate. Handling remains safe even with the stability control deactivated. With rear-wheel-drive (also available, unlike with the X3), doing the same might incur significant risk for those without supreme driving skillz. It might be possible to eliminate even the touch of crossover misbehavior by opting for the M Sport Line package, which wasn't on the tested X1. To the (sans M) Sport Line, the M package adds a sport suspension, paddle shifters, and torque vectoring. The last should make the X1 even more willing to rotate when hustled. In other all-wheel-drive cars (Audi S4 and S5, I'm thinking of you) I'd say that anything that mitigates understeer is a must, for entertainment purposes as much as functional ones. But the X1's chassis is quite dynamic even without it. With so much good stuff, why is handling in the third spot? You might notice that I haven't said much about the steering. All-wheel-drive X1s retain BMW's old hydraulically-assisted system, which would seem a plus. On top of this, the tested car had the $250 Servotronic option, which allegedly varies assist more with speed. I detected little such variation. In casual driving, the weighty steering makes the X1 feel heavy and unresponsive. Its heft feels much more appropriate in aggressive driving, but even then I couldn't quite connect. The lighter, quicker (but less linear and predictable) steering in the Evoque makes it feel more lively and agile, especially in casual driving. Objectively, both the X1 and the Evoque weigh about 3,700 pounds, light for premium crossovers and about the same as a previous-generation 3-Series wagon with AWD. (But 800 pounds heavier than my Protege5 even without the 200 added by AWD.) But with its higher center of gravity and far less balanced weight distribution, the Evoque likely can't keep up with the X1 on a curvy road. So, at least until I get more seat time in the baby Range Rover, I'm calling handling a tie. BMW makes great sport seats, with support in the right places and power-adjustable side bolsters. This said, those in the X1 Sport Line feel less cushy, and so less overtly comfortable, than I recall from other BMWs. The Evoque's front buckets lack adjustable side bolsters, but feel more luxurious. While the BMW wins on support, the Land Rover wins on comfort. Another tie. Update: when I later had an Evoque for a week its seats felt less comfortable than they had during the dealer test drive. So I'm revising this rating in favor of the BMW. Price isn't often among the "why to buys" for a BMW. But the X1 has the lowest staring price in the line, $31,545. AWD adds $1,700. Keep ticking boxes, and you end up at the tested car's $45,095--or higher. Far from the starting price, but still a non-trivial $5,000 less than a comparably equipped Evoque, X3, or 2011 3-Series wagon. Another possible alternative, the 9.4-inch-longer, 2.8-inch-less-tall, wagon-on-heels Audi allroad, is about $6,400 more than the X1. Why Not the 2013 BMW X1? The X1 shares a 108.7-inch wheelbase with the previous-generation 3-Series, and its 176.5-inch overall length represents a mere 1.7-inch truncation. Yet, based on official measurements, it has ten fewer cubic feet of cargo space behind the second-row seat. How is this possible? The X1's more steeply raked, more hatchback-like D-pillar probably explains much of the difference. Its wheel wells might also be more intrusive. Compared to the Evoque, the X1 has about a quarter less cargo volume behind the second-row, 14.8 vs. 20.3 cubic feet. And the allroad has nearly twice as much, 27.6. Fold the second row seat, and the difference shrinks, 47.7 cubic feet vs. 51.0 and 50.5. Guess what? My Protege5 also has far less cargo volume than you'll find in a compact crossover, or even in a true compact wagon. (The P5 looks like wagon, but proportionally it's a hatchback.) Yet the Mazda easily contains my weekly haul from CostCo and the grocery store for a family of five. I rarely stack cargo high enough that the shape of the upper body becomes a factor. I hardly ever even have to fold the seat. Unless you need to carry large items, or a lot of smaller ones, the X1 will do. Handily. The small quasi-crossover might not have much more cargo capacity than a compact sedan, but the rear hatch makes what it does have easily accessible. The BMW X1's interior dimensions also closely resemble those of the previous-generation 3-Series. Up front, there's a little less space to stretch out than in the X3. But abundant headroom. About half of the X1's additional height is over one's head--you sit only a couple inches higher than in the 3-Series. This additional airspace also distinguishes the X1 from the allroad. Rear seat room could be more of an issue. As in the old 3 and the new allroad, a couple of average-sized adults will fit behind a couple more with perhaps an inch or two of clearance for their knees, while a third would be a squeeze. The seat back reclines, but the seat cushion is too low to provide good thigh support. The Evoque is similarly a less-than-ideal choice for four-plus adults taking a long trip. Double kidney grille and angel eye ringed headlights--it's a BMW. No room to spare, but the rear seat does recline. Even without the M Sport Line's sport suspension, the BMW X1 rides firmly, if not harshly. The new 3 with its standard suspension is smoother, but with less body control over patchy pavement. With a higher center of gravity to manage, the X3 rides more firmly still, so the X1 doesn't strike a bad compromise. There are simply more insulated alternatives, if that's what you're into. The Evoque's standard suspension might be a touch more absorbent, but not quite as composed. They're close enough that, for now at least, I must call another tie. Mat the go pedal, and the BMW X1 scoots--but too often only after a moment of hesitation. While turbo lag might be a minor factor, the electronic controls probably deserve most if not all of the blame. This hesitation, along with the insufficiently direct steering, prevented a thrillingly tight connection with the car. I don't recall this hesitation from other BMWs with the same powertrain, so this characteristic might be unique to a press car confused by having a different driver every week. Or perhaps the rest of the car's behavior was so close to my personal ideal that my expectations were higher. Most of these whys and why nots for the X1 should not come as a surprise. Of course BMW's smallest, lowest crossover compromises rear seat and cargo space, but costs the least. Of course it accelerates quickly and handles very well. Ideally, I'd like a more responsive powertrain and more direct steering, but competitors are little if any better in these areas. Ultimately, what makes or breaks this quasi-crossover is its driving position. Some potential buyers would prefer to sit lower. Others would prefer to sit higher. But, for a combination of visibility and handling, Goldilocks would find the X1 "just right." Powerful and efficient, but the sounds aren't sweet and responsiveness could be better. The X1's cargo space is more competitive with the rear seat folded. BMW provided an insured car for a week with a tank of gas. John Seigle at Land Rover of Farmington Hills, MI, provided the Evoque test drive. He can be reached at 248-426-3614. 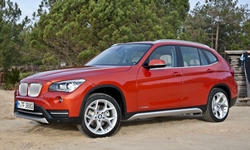 2013 BMW X1 pros and cons, according to Michael Karesh: the best reasons for buying (or not buying) the 2013 BMW X1. Join TrueDelta to post your own impressions.